Check in is from 5-9pm, EST. If you are going to arrive after 9PM, you must call to arrange for a late check-in. If you choose not to do this, you will not be able to stay at the hostel on the night of your reservation. We accept all forms of payment except personal checks and paypal. We have a 48 hour cancellation policy. If you do not cancel within 48 hours, you will be charged for the first two nights of your stay and the remainder of your reservation will be canceled. This is one of those great hostels where you really feel at home. Comfy, sturdy beds, a nice fluffy towel, single-occupancy bathrooms that are sparkling clean, these are the touches that make NotSo Hostel so comfortable. There's also a great atmosphere provided by the staff and the occasional bonfire at night in the backyard. My personal highlight: Best coffee I've ever had in a hostel! Thanks so much to Vicki (sp?) and the staff for putting up with all of us during the 2nd annual AHC. It was so nice to finally stay here and meet all these wonderful owners. The hostel has everything you will need and should expect from hostel accommodations. There is a great outside area where people from the different buildings can congregate and socialize around the bonfire. Can't wait to come back next year! Beautiful house located walking distance from King Street. Clean rooms, kitchen and multiple bathrooms available. The staff was my favorite part! Ariana (she works there) cooked a nice soup for dinner and it was delicious! She was so fun and she created a nice environment for us to talk and make friends with the other people staying at the hostel. I definitely recommend staying here! I was on a road trip, but even if I was to go there by myself I’m sure I would never feel alone. Loved my stay! Made going to Charleston much cheaper! Only a ten minute drive from the market center! I love the Notso Hostel! Have stayed there twice now and will always return when I am in town. The location is great, the staff super nice. The grounds are lovely. The only thing lacking is a comfy hang out area. They close the only room with couches at 10 and you have either the kitchens or the small rooms in the outter houses which aren't like my couch at home, but for all the other great benefits I love it! 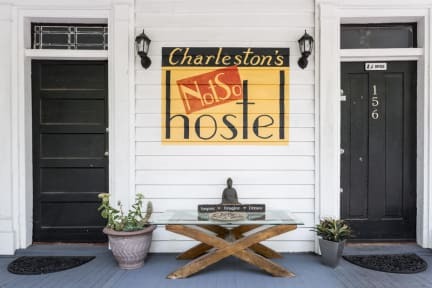 Charleston's NotSo Hostel is great! Cute, clean, and good value for your money. I'm really glad a hostel like this exists in Charleston. So many hostels have such terrible reviews, for being dirty and sketchy, and it's really frustrating to have to pay triple digits for a hotel, when all you want is somewhere clean and safe to sleep for a few hours. This hostel is exactly that. For a nearly standard rate of $32, you get a really good deal. I definitely recommend it and hope to return! This is a collection of wonderful old 2 story building with great lage porches on both floors. I was in a 4 bed room, slightly crowded, but pretty. Breakfast is self-serve, instnt oatmeal, and coffee or tea (which is available all day. Staff and manager are very nice. I enjoy this place I have stayed before and would stay again. I loved the house itself and the location was excellent! Everything was clean, secure, and staff was great. The only issue I had was in our room (4 bed female dorm - Cyprus). I was in the top bunk and had a difficult time getting into or out of bed without getting hit by the ceiling fan. Also, there was one ladder for both top bunks to share so we had to strategically place it so either of us could get to it in the morning. The rungs on the ladder were thin and uncomfortable when using. Great staff and usually mix of travelers. Very good fresh organic coffee available. Old house with character, probably even more so in Spring or Fall not early Winter when I visited. Basic comfortable lodging in which a lot is walkable on Downtown Charlestown.